An interesting article by Andrew Pierce in the Daily Mail tells us that the spate of FUD we've been experiencing of late is being co-ordinated, largely by Business for New Europe (BNE), with the support of founder Roland Rudd and his City PR company Finsbury. Certainly, in EU circles, BNE is extraordinarily influential, being able to attract Commissioners to its dinners and references on commission websites. 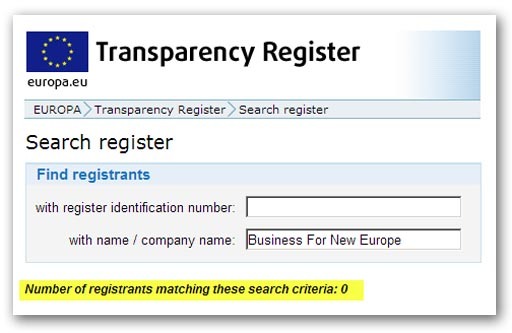 Interestingly, despite being established lobbyists, the group is conspicuously absent from the EU's register of lobyists (search result illustrated above), as indeed is Mr Rudd's own company. This is not entirely unexpected though – working in the shadows seems to be Mr Rudd's speciality. But this is by no means the first time that Mr Rudd has come to the notice of the Mail. The paper was complaining of, "another schmoozing lobbyist with too much clout" back in December last year, a man with political inclinations left of centre and strongly pro-Europe. Researcher and policy co-ordinator for SDP founder David Owen before moving into journalism, he worked at the Times and Financial Times before leaving to set up Finsbury in 1994. He became a useful cheerleader of the New Labour project, working closely with Peter Mandelson and personally canvassing for Mandelson in the 2001 election. Mandelson became godfather of one of Rudd's three children. But Rudd also cultivated the then Prime Minister Tony Blair, and is close friends with BBC business editor Robert Peston, having worked with him on the FT. Currently, Nick Clegg is also a close associate. Today Rudd's firm has a turnover of some £50 million and has somewhere between one quarter and a third of the FTSE-100 companies as clients. He lives in Holland Park, not a million miles from David Cameron, with his dress-designer wife. Yet, despite evident distaste for Rudd, the Mail as a newspaper seems quite happy to take stories sourced by him and to spread them uncritically. Recently, Euractiv had Rudd as number 38 in a list of the 40 most influential Britons on EU policy. The man undoubtedly has greater influence on UK policy and, where there is dirty work afoot, "Rudd the FUD" is probably the man behind it.